The Energy 202: The Pentagon takes climate change very seriously. This government watchdog says that's not enough. Within the Trump administration, the Pentagon is arguably and, perhaps to some, surprisingly one of the most progressive departments when it comes to contemplating the effects of a changing climate. Even so, a government watchdog says saying so without taking action is not enough. On Wednesday, the Government Accountability Office released a report on the climate preparedness of the Pentagon, concluding that while the department frequently voices concern about how rising sea levels and atmospheric temperatures could affect military activity abroad, it is not doing enough to turn those words into action at foreign facilities. Beginning in 2014, the Defense Department began surveying those running military installations in order to identify how climate change may affect the bases they oversee. The watchdog also found the military's review was "incomplete and not comprehensive" because dozens of overseas sites were exempt from completing the vulnerability assessment — and because the Pentagon doesn't consistently track the estimated cost of climate impact. Some ways of adapting to a warming planet are apparent. For Navy bases, for example, piers need to built higher to avoid being inundated by future flooding. But in other cases — like a desert base potentially facing more intense drought — how does a commander adapt? The Pentagon isn't giving its far-flung military leaders at overseas bases enough guidance on how to do that, GAO concluded. “We believe that there are opportunities to improve that,” said Brian Lepore, director of defense capabilities and management at GAO, who led the team that wrote the report. Lepore and his colleagues visited 14 military facilities, and interviewed leaders of 31 more. John Conger, a senior policy advisor with the Center for Climate and Security and former deputy comptroller at the Pentagon, said the Defense Department would "lose the forest for the trees" if it focused too closely on tracking estimated costs. "It can only benefit DoD to become more resilient to climate impacts, but it isn’t clear that applying their effort to accounting for climate costs would help that," Congers said. But Conger thought the report was correct to say more guidance is need. "GAO’s most important conclusion is that DoD needs to update lower-level guidance to show installations officials how to implement the overarching direction that they incorporate climate impacts into their plans," he said. GAO, an agency that audits federal programs for lawmakers, undertook this report at the request of Sen. Bernie Sanders (I-Vt.) and five Senate Democrats. Among Cabinet members in the Trump administration, Mattis holds views on climate change that are most closely in line with the scientific community, which sees global warming as a real and dire threat. Even Congress, controlled in both chambers by a Republican Party deeply skeptical of mainstream climate science, has shown a willingness to give the Defense Department wide berth on the issue. In July, a climate-change provision in a defense reauthorization bill, requiring the Pentagon to assess the vulnerabilities of the 10 bases most threatened by climate change in each service, survived a 185-to-234 vote in the House to strip it out. On Tuesday, Trump signed the authorization bill into law. -- Patagonia protest: On Tuesday, Maria Cantwell of Washington, top Democrat on the Senate Energy and Natural Resources Committee, registered a protest against President Trump's decision to reduce in size Bears Ears and Grand Staircase-Escalante national monuments by wearing a Patagonia jacket to a committee hearing. Like Cantwell herself, Patagonia has been critical of the national monuments' decision, declaring on its website "The President Stole Your Land." Interior Secretary Ryan Zinke responded by calling the claim “nefarious, false and a lie," noting none land of the targeted land was being sold or transferred to the state of Utah. Cantwell responded more directly to Trump last week: "President Trump is using unlawful authority to pollute these special places. His administration deserves an 'F' for stewardship." Native American tribes and environmental groups think the move is illegal, too, and sued last week. -- Elsewhere, in the Senate, Democrats were loudly protesting a set of provisions in the GOP tax plan that would cripple incentives for renewable energy investments “The impact of this bill will create tremendous uncertainty at best within the renewable industry and an absence of investors,” Sen. Benjamin L. Cardin (D-Md.) told reporters at a news conference, according to the Washington Examiner. He was joined by Edward J. Markey (D-Mass. ), Sheldon Whitehouse (D-R.I.), Brian Schatz (D-Hawaii), Amy Klobuchar (D-Minn.), Jeff Merkley (D-Ore.), Tom Udall (D-N.M.), Michael F. Bennet (D-Colo.) and Richard Blumenthal (D-Conn.). Some of those changes appear intentional, as is the case with a House provision watering down wind-energy tax breaks, while others appear to be the result of the haste with which Republicans are undertaking their tax project, as is the case with a Senate provision designed to discourage multinational corporations from moving profits and jobs overseas but which inadvertently sweeps up wind and solar tax credits. -- Pruitt’s $25,000 privacy booth, investigated: The Environmental Protection Agency’s inspector general will look into whether agency chief Scott Pruitt broke federal spending laws with the purchase of a $25,000 secure phone booth using taxpayer funds. Rep. Frank Pallone Jr. (D-N.J.), the ranking Democrat on the House Energy and Commerce Committee, said he requested the probe earlier this fall, The Post's Brady Dennis reported. The Post reported in September the EPA spent $25,000 for the secure, soundproof booth in Pruitt’s office. "Typically, the type of soundproof booth like the one installed at the agency’s headquarters is used to conduct hearing tests. But the EPA sought out a far more expensive, customized version that Pruitt could use to communicate privately with top government officials," Dennis writes. He added the EPA also appeared to spend nearly $8,000 removing closed-circuit television equipment from Pruitt's office to make room for the booth. -- Energy investigated, too: GAO concluded the Trump administration ­violated the law by wrongly withholding funds for the Advanced Research Projects ­Agency-Energy (ARPA-E), The Post's Steven Mufson reported. The GAO said the administration has since released the funds for the popular Energy Department program supporting energy innovation, which were part of the fiscal 2017 budget. But the worry is the administration might illegally impound funds in the future for programs the president opposes. -- Uranium mining ban, upheld: The U.S. Court of Appeals for the 9th Circuit on Tuesday upheld a 20-year ban on uranium mining around Grand Canyon National Park imposed by the Trump administration, The Post's Juliet Eilperin reported. Trump administration is considering lifting the ban, in place since 2012, as part of a broader effort to boost domestic the mining of critical minerals in the United States. The National Mining Association,, a lobbying group, had challenged the ban. -- Trump vs. the butterflies: The North American Butterfly Association is filing a lawsuit against the Trump administration over its plan to build a border wall with Mexico that would go through its Butterfly Center in South Texas. The Hill’s Lydia Wheeler reports the group’s 20-page complaint charges the proposed wall would cut off two-thirds of its property and destroy the Butterfly Center, leading to a loss of $450 million in ecotourism. The Post’s James McAuley writes about the highlights from Tuesday’s “One Planet” summit in Paris to mark the two-year anniversary of the Paris climate accord. At the summit, McAuley says that French President Emmanuel Macron continued to position himself as leading the global charge against climate change in what he has called a “counter-momentum” against the Trump administration. 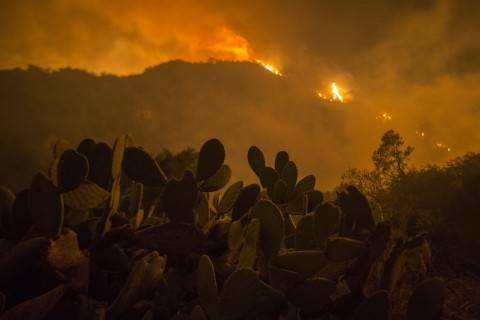 -- California is still on fire: Multiple fires are still raging across Southern California, though most are largely contained after more than a week. The largest fire, the Thomas fire in Ventura and Santa Barbara counties, had burned through at least 236,000 acres as of Tuesday evening, and was just 25 percent contained, according to the Los Angeles Times. Evacuation orders had been lifted in Santa Paula and Ventura County, Calif. as the blazes shifted. And the newspaper’s Javier Panzar writes as well that in Montecito, where the fire has shifted, the area’s heavy vegetation, narrow roads, steep terrain and closely packed homes make for a dangerous situation. As for the other fires, the Liliac fire in San Diego County was 92 percent contained, the Skirball fire in Bel Air was 85 percent, the Creek fire in Sylmar was 98 percent contained, and the Rye and Liberty fires in Santa Clarita and Riverside County were 100 percent contained as of Tuesday. And The Post's Marwa Eltagouri reports that the fire in Bel-Air was sparked by a cooking fire at a nearby homeless encampment. California fire officials have notified Southern California Edison that the utility’s equipment is under investigation for its potential contribution to the cause of some of the state’s fires, according to the LA Times. “This data set shows that the magnitude and the sustained rate of warming of the sea ice decline is unprecedented over the last 1,500 years and likely longer,” Emily Osborne, a researcher with the NOAA Arctic Research Program, said at an event unveiling the 2017 report. -- Off the charts: Capital Weather Gang’s Angela Fritz reports that when NOAA was working on its monthly climate report, the agency noticed data from one of its key climate monitoring stations was missing. The temperature in Barrow, Alasla, the northernmost city in the United States, was “warming so fast this year, the data was automatically flagged as unreal and removed from the climate database. It was done by algorithms that were put in place to ensure that only the best data gets included in NOAA’s reports." Since 2000, the average October temperature in Barrow jumped 7.8 degrees. For November, it increased 6.9 degrees and for December, it had gone up 4.7 degrees. Scientists are coming up with a new algorithm to prevent legitimate temperature spikes from getting kicked out of the data sets. Farmworkers are risking their health to harvest produce near California wildfires. Farmworkers are working 8 to 10 hours days, often without gear to protect them from the smoke. 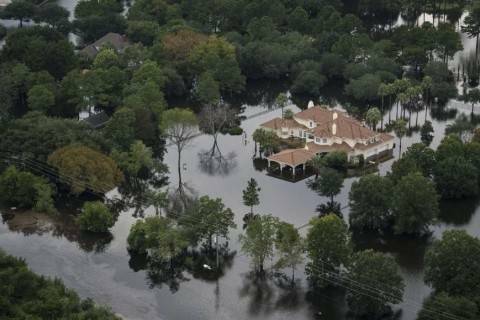 Storms like the one that flooded Houston and a wide area of Texas in August are also much more likely, the studies found. -- Your morning commute: Transit agencies are being cautious about shifting toward the use of electric buses, according to a report from Reuters. Out of more than 65,000 public buses in the country, just about 300 are electric. That may be because electric vehicles are expensive and have yet to be used on a mass scale, per the report. Electric vehicles are also not as efficient in extreme road or weather conditions. The hesitation comes even as manufacturers are predicting huge growth in this area -- Reuters reports that the most ambitious forecasts predict all bus purchases to be electric by 2030. FuelCell Energy builds natural-gas microgrids. Now it's looking to build zero-emissions fossil-fuel power plants. The House Science, Space and Technology Subcommittee on Energy holds a hearing on advancing solar energy technology. The House Natural Resources Subcommittee on Federal Lands holds a legislative hearing on Grand Staircase-Escalante Bill on Thursday. National Journal holds a webinar on Trump and NAFTA on Thursday. The Dialogue holds an event on the Trump administration, Latin America and Energy on Friday.